Lock in a yearlong rebate by spending a minimum of $5,000 on Qualifying Products during the Early Order Period: October 1, 2018 to February 28, 2019. Your yearlong rebate is valid for all purchases of Qualifying Products made during the Program Year: October 1, 2018 to September 30, 2019. The more you order, the more you save—and with the Barricade® Brand Bonus, rebates can be as high as 12%. Your yearlong rebate ranges from 5% up to 9%. Your percentage is determined by the dollar value of Qualifying Products purchased during the Early Order Period. When you purchase Barricade brand herbicides you get an extra 3% added onto your yearlong rebate for savings of up to 12%. 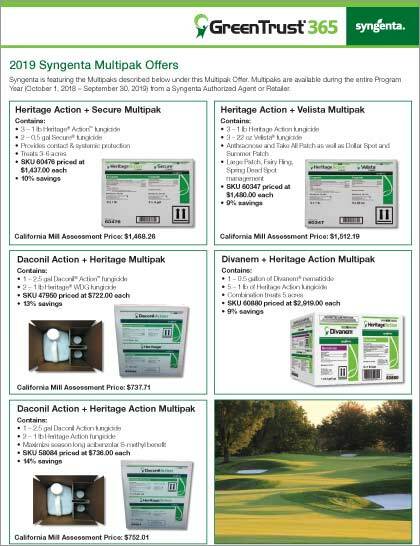 Brands include: Barricade 4FL (1 gal), Barricade 4FL LinkPak™ (10 gal), Barricade 4FL (30 gal), Barricade 65WG (5 lb) and Fertilizer with Barricade. *Rebate percentages are valid for any purchase made during the program year: October 1, 2018–September 30, 2019.